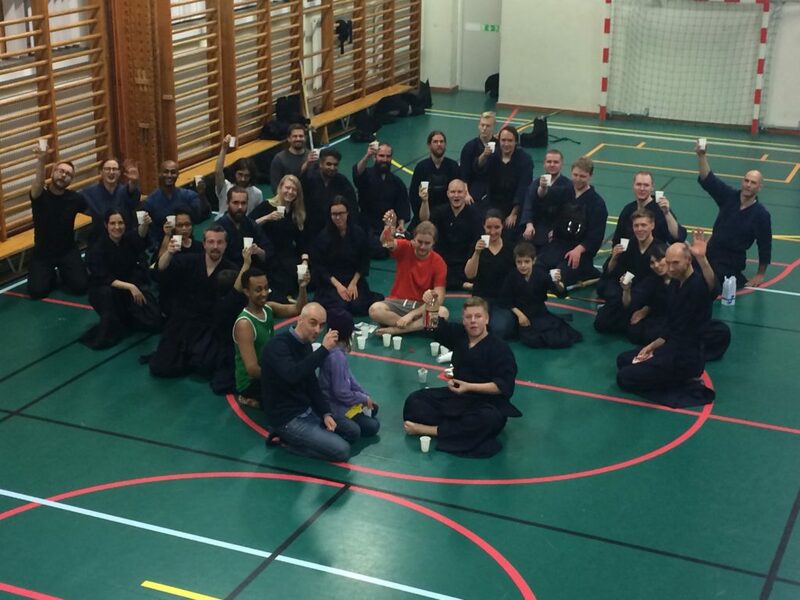 Kibo Dojo teaches that if you want to learn Kendo you need to meet and practice with many different people. Hence, we really like having visitors. To make it easier to join our Keiko we’ve put together a few useful points. Make sure that your own teacher approves as s-/he may have specific plans for your development. If it is your first visit, or if it has been a couple of months since last time, please collect the approval of Kibo Dojo teachers (See Contact) or if you are invited by one of our members please make sure that your friend has checked with the teachers. If you cannot make it to the beginning of the class (due to work, travel etc) do not worry; life is like that sometimes, just do you best. When you arrive at the Dojo you should introduce yourself to the main teacher of the class. Also inform the teacher of any injuries or illnesses that may be relevant. Keep you gear on the student side of the Dojo. If you are not sure which side this is please ask someone. If the practice starts with Kata you can take of your Do and prepare Bokuto. The order of line up in Kibo Dojo is by: Grade, How long you have had the grade, Age. However, the captain (top left) is always a Kibo Dojo member. The first 10 minutes is individual warm up. There is a standard method; please check with someone. The main rule is that you are not allowed to stand around during this time. The training at Kibo Dojo is pretty traditional with most of the exercises names in Japanese. You need to be aware of the great spread in age and experience and take care not to injure or rough up any of the other members. Giving technical advice to someone you do not know should be kept at a minimum and if done at all in need to be kept short. A pretty safe rule is that if you hold a Dan grade and are two levels higher that you training partner, some advice may be OK. Advice between good friends are OK but should also be kept short. If you do not speak Swedish it is perfectly fine to ask for clarification, either from the other students or from the teacher. Typically it is sufficient to just look around on what the other are doing. Typically the members does not rush to bow after practice unless they have specific requests. As a first time, or not so frequent, guest however it may be appropriate to greet the teachers that you have trained with and the teacher that has led the class. The last Monday of the month is the official “After Tsuki” at a nearby restaurant. But there are impromptu After Tsukis many other days too.